Why White? Keyboard Keys and Mouse. Discussion in 'Mac Accessories' started by Exodist, Dec 24, 2012. I prob should be headed to bed. My brain is wondering to much again.. I was wondering why Apple is making the Keyboard Keys and the Mouse tops white when the iMacs, TBD's and Mac Minis all use a Aluminum and Black scheme. On my MBA its Aluminum with Black Keys. Is it they just haven updated the models yet or something? You would think the AL and Blk color schemes would look very nice on the bluetooth keyboards and mice. Well I do, but each their own I guess. I guess a KB re-design on Apple laptops would be an idea, but you can say the same for the current Imac and stand-alone BT KB's they haven't been changed in years...I wouldn't mind a change personally...Black On White is good, and might look okay on the USB KB and the BT offering...I'm more interested in my upgrade and where it is at the moment though.. I was referring to putting the black keys on the current bluetooth KB and magic mouse. I just really like the AL and piano Blk color scheme. IMHO the Magic mouse would look awesome as well with a shiny black top. Plus they should offer backlit keys on the wireless keyboards. Yes it would eat into battery life. But a USB charger would solve that.. Surprised they dont already have one for the KB and Mouse. I have a BT KB, but to be honest, I don't use it...The keys are a little too close together, I've tried it with my iMac, Ipad and laptops, but it just isn't right for me...How about a complete re-vamp across the range? A slightly wider layout would be good....That BT is just sitting on a desk, unused. I think it's to be different. Years ago all headphone had black cables, no exceptions. Then apple came along with the white ones and everybody followed suit. I think keyboards are the same. They all used to be cream, then black. Then apple came along and produced something different. Every word you just said was absolute accuracy. Well done. I would love to see black keys on the BT-KB, backlit would be nice too. I would the covers on Amazon, but I feel like it would take away from the look and feel of the keyboard. True very true.. All good post.. It's fairly obvious that Apple need to refresh their keyboards and mouse to match their black/aluminium lineup (abandoning white, except for the white delineating characters on otherwise black keys). Even more annoying, and driving many reluctantly to Logitech, is Apple's bizarre refusal to release a full-size wireless keyboard, which should really be a simple matter. I just don't understand how a company of Apple's size, which strives to offer a complete user experience (both hardware and software, and synching devices), has dropped the ball with peripherals for this long - do they really want their beautiful devices mixed and badly matched with others' plasticky offerings? 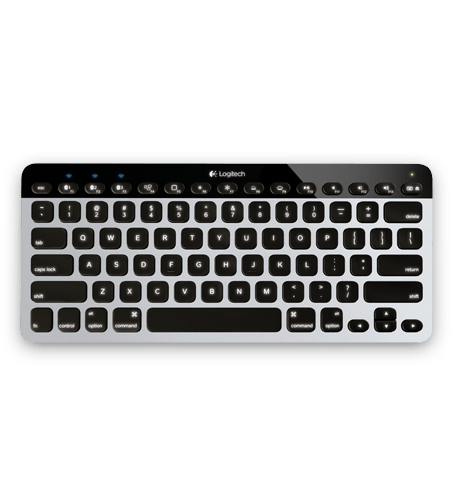 Logitech have got a new Bluetooth Mac keyboard coming out soon and it's got black keys and is backlit. It's also got easy switching between your Mac, iPad and iPhone and is rechargeable via USB. I like that a lot. I like the look and style of the Apple keyboard better, but that's a close second. The Logitech K750 is probably the best alternative, but the solar panel is ugly, and I'd much prefer to use an Apple full-size wireless keyboard (if only it were available! ).